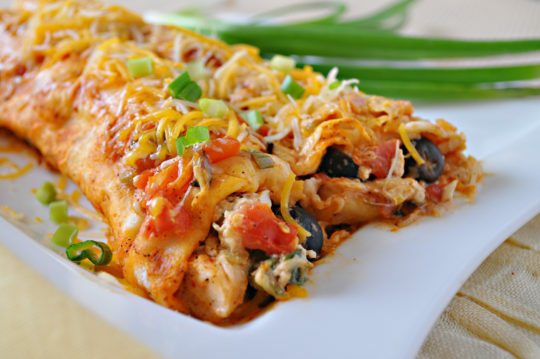 Whip up these “wow”-inducing enchiladas in no time using rotisserie or leftover chicken. Toss in a can of black beans, drained and rinsed, for added flavor and nutrition. This recipe is from Holly Clegg’s trim&TERRIFIC® Gulf Coast Favorites cookbook. Preheat oven to 350 degrees. Coat 13x9x2-inch baking dish with nonstick cooking spray. In a large bowl, combine sour cream, soup, onion, and green chilies. Mix well. In another bowl, combine chicken, 1 cup cheese, and corn. Add about 1/3 of the sour cream mixture and mix well. Spoon chicken mixture onto a tortilla, roll and place seam-side down in prepared pan. Repeat with remaining tortillas. Spoon remaining sour cream mixture evenly on top of filled tortillas. Sprinkle with remaining cheese and top with enchilada sauce. Cover with foil and bake for 20 minutes or until well heated. Remove foil and sprinkle with the green onions. Cook for 5 more minutes before serving.